The JC Series is the go-to lens for many machine vision projects. It has all the features and performance characteristics most applications demand. 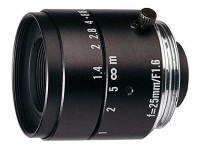 This lens has a compact metal housing that moves the front and rear spherical elements independently for better resolution and contrast, regardless of working distance. The focus and aperture adjustments lock-down with thumb-screws to resist equipment vibration. The optical resolution is 100 lp/mm at center and 60 lp/mm at the corners. The minimum object distance is just 20 centimeters.